Do you know your onions? From large, sweet onions to shallots, garlic, chives and leeks, the allium family contains some of the most popular vegetables in the world. Shy of the spotlight – except when repelling vampires, preserving mummies, curing heart disease or predicting the future – this lowly family of plants has been a friend to mankind from earliest times. 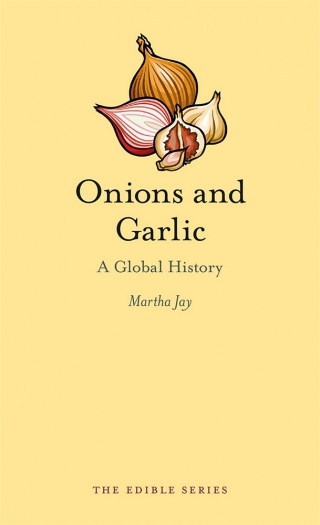 Onions and Garlic follows the trail of these cherished plants through history and across the globe, tracing their story back to the earliest civilizations of the Fertile Crescent and the recipes of ancient Mesopotamia. Traders spread onion varieties through Central Asia and from there they moved across the world, as civilizations from the ancient Romans and Greeks to the Koreans and Japanese found this humble family of vegetables an indispensable part of their cuisines – and of their culture. The book reveals the close relationship between the allium and human worlds: the Welsh have proudly adopted the leek as their national symbol; in many societies, garlic has long been identified as a magical herb with supernatural origins; while onions symbolized the simple peasant life to French painters of the nineteenth century. Celebrated, denigrated, avoided or sought-after, the story of the allium family is filled with fine cuisine and art, peasants and kings, colonization and conquest, magic and medicine. But most of all, it’s the story of a very ordinary vegetable. Martha Jay is a writer and editor based in London.